Are you learning all you can from your analytics tools? There’s a big difference between content publishing and content marketing. Content publishing is more or less just putting content up on your website or social media channels, and hoping it will be of interest to somebody. The goal of content marketing, on the other hand, is to get your prospects to do something, to alter their behavior as it relates to your company and product. It might be to get them to do something easy, like continuing to read an article, or it might be to get them to do something that represents a small commitment, like sharing an article on Facebook, or filling in a download form on your website. Or it might be an even bigger step, like signing up for your newsletter. The key to knowing how to direct the online behavior of your prospects of customers is to understand everything that’s happening in your digital ecosystem. And for a full understanding, you need to know the numbers for everything from your website analytics to your traction on social channels. Luckily, thanks to the analytics capability of today’s platforms and applications, there’s a wealth of data just waiting for your review. That’s the upside. The downside is that, with so much data available, it’s easy to be overwhelmed. So what analytics tools and metrics should you put your focus on? Quantitative – this includes things like number of visitors, page views, bounce rate, time on site, etc. How your content drives behavior – this covers the actions that are triggered by your content, such as clicking links, sharing, filling out forms, etc. For your website, your best bet is Google Analytics. It’s free, it integrates with other applications (including Google AdWords), and if you wish to do a deeper dive into your analytics, you can upgrade to the paid version, Google Analytics 360. If you’re just getting started with Google Analytics, consider taking a quick course - ‘Google Analytics for Beginners,’ through the Google Academy. It’s a great video overview of how to get started. Then, you can choose the metrics that impact your business the most, and monitor those. 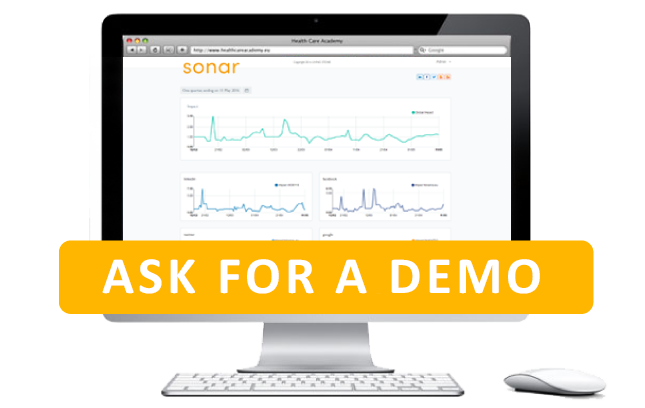 To measure the impact of your social media marketing, SONAR is an easy-to-use digital marketing analytics tool and reporting service, developed by Living Stone. SONAR aggregates all analytics from social media channels, Google Analytics-driven online pubs, e-news engines, and APPs into a single score, to provide you with precise information on the global impact of your digital marketing activities. 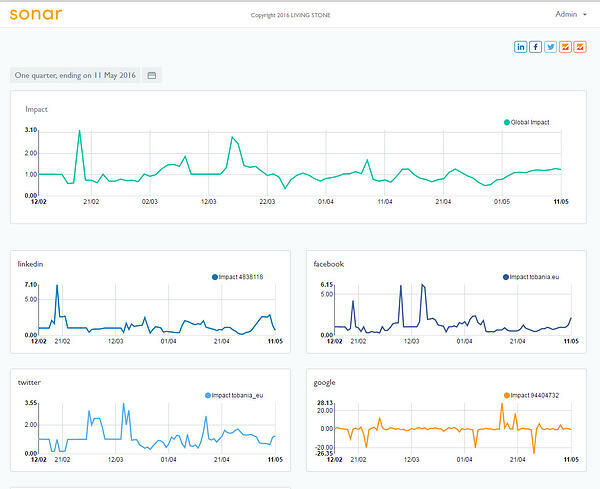 SONAR aggregates analytics from each platform including likes, impressions, shares, comments, activity, page likes/followers, sessions, page/session, users, new users, website pages, devices, cities, referrals, top 5 pages, top 5 social media posts, number of new followers per day, and more. The results are presented in a single, easy-to-read graphic, illustrating the global impact of your social media programs. SONAR also measures the impact of each channel separately, so you can easily assess how your content scores across different channels. You can see which posts have the most impact, and which posts go viral, as well as the direct results of that impact, including impressions, likes, reach, comments, effects on other posts, effects on page likes, etc. Reports are available via a custom dashboard, on-demand, quarterly, monthly – whatever schedule meshes with your goals. At Living Stone, we’re experts in understanding and applying analytical tools that can help you boost your digital campaigns and meet your marketing and sales goals. Are you looking for support to capture and act on insights across your digital activities? We can help you implement Google Analytics and choose the metrics that matter most for your organization, and set up SONAR to collect key insights on your social media programs.